I have been a collector of old bottles since 1975, with a particular interest in the bottles originating from my hometown of Carnarvon. This interest is the main reason for my passion for the history of the old mineral water companies, breweries, wine & spirit merchants, chemists, and public houses of the town. The system of refuse disposal in the town during the 19th. Century means that bottles dating from before 1900 are fairly scarce, as the dumping sites used have been built over. 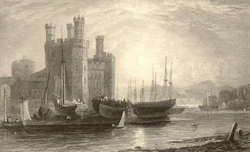 Apparently, up to the middle of the century refuse was dumped into the castle moat, and when that became full, they began to dump on the site of the Mill Pool at Pool Hill and Pool Side. Eventually this site was built upon and the council had to find yet another dumping ground. They solved the problem by utilising the strip of ground between St. Helen's Road and the River Seiont, dumping commencing roughly where Scottish Power (MANWEB) have their offices today. The refuse quickly filled the available space, moving steadily along under the site of the present day Gas Works and the Welsh Water Treatment Plant, until the tip was encroaching upon the Public Park. It was then decided that the park be closed so that dumping could continue, leaving the town with only a single park, the "new park" which was created on the Upper Morfa next to the main Pwllheli road, near the Seiont Bridge. This new park had been opened in 1884. In the early 1970's bottle collecting began to gain popularity as a hobby in the UK, and soon most available old refuse tips were being dug with fervour to find the highly collectable bottles they contained. The only part of the old tip at St. Helen's Road which was accessible for digging was the later section, which meant that the items found dated from around the turn of the century and after. This means that earlier bottles are highly prized whenever they come to light. This rather rambling introduction is a means of trying to convey the excitement generated amongst local bottle collectors when something unusual and unexpected is discovered. So it was when, about ten years ago, a collector from South Wales wrote to me letting me know that he had discovered a previously unknown Carnarvon bottle. 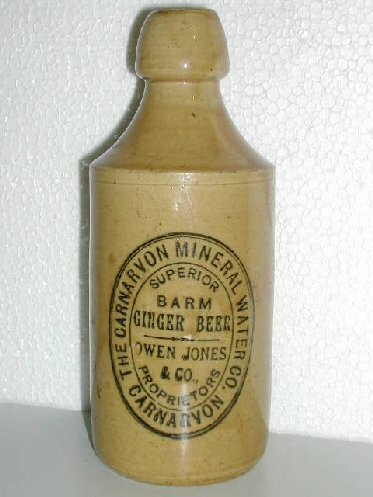 This bottle was a stoneware ginger beer bottle, pictured left, very scruffy looking, and bearing the printed legend "THE CARNARVON MINERAL WATER Co. SUPERIOR BARM GINGER BEER, OWEN JONES & Co., PROPRIETORS, CARNARVON"
Who was Owen Jones & Co. and the Carnarvon Mineral Water Company? There is no mention of them in any of the Trade Directories, and a search of the available census returns did not reveal a likely Owen Jones. About three years later, another example came to light, this time at an Anglesey car boot sale. Again, the bottle was pretty battered and scruffy, perhaps hinting at poor manufacturing techniques and quality control. So now there were two. But still no clue as to who Owen Jones was. Over the intervening years I have searched high and low for any scrap of information about this company, but always ending up no closer to solving the mystery. It seemed that the elusive Owen Jones had covered his tracks pretty efficiently. Until now. A few days after Christmas, I was searching the Gwynedd Archives Service's online catalogue for something totally unrelated when I came across an entry buried amongst a host of references to the firm of Thomas & Edwards. I almost missed it, in fact what I had just read did not register at first and I had to backtrack to read it again. XM/2070/118. SCHEDULE of all the lots purchased by ’Caernarfon Mineral Water Works’ at the sale of Mr John Owen Jones. Lists the equipment and accessories bought and the prices paid. John Owen Jones was well-known to me as a Wine & Spirit Merchant and he was the licensee of the Palace Vaults (Pendeitch) on the corner of Castle Ditch and Palace Street for a number of years. He took over the business from the late William Roberts in 1876/1877. He was born on the 9th. of November 1832, the eldest son of John Jones, Stonemason, and was the brother of Hugh Jones, Marble Works, St. Helen's Road. For many years he had been in business as a Painter & Coach Builder, firstly at 11 Northgate Street, and later at the Brunswick Buildings on Castle Square. He had retired from this trade in 1876, the business being taken over by Robert Williams. He had also served on the Town Council for a number of years. Schedule of all the lots purchased at the 6th. Oct. 1892 sale - by Mr John Owen Jones - with prices attached. Amongst the stock were: Two crates of Bottles containing about 68 dozen - £1.17.6; Abt. 24 dozen Ginger Beer Bottles, in four baskets. Egg shaped - £0.5.0; 79 cases full of 2 doz. split bottles - £3.5.10; 3 cases of 6 doz. Bottles, Ginger Beer full, & one half case splits 6 doz. - £0.4.0; One 6 doz. case beer bottles - £0.0.6; 8 two doz. cases split Codds - £0.6.8; Codds full 8 of 3 doz. (15 bottles short) - £0.18.0; 5 empty ½ dozen Cyphon cases - £0.1.0. Obviously, all this was bought second hand, but there is no indication as to the seller's identity, although the final page, dated the 10th. of December 1893, is signed by a Wm. (?) Owen (below). middle initial a 'J' or a fancy 'H'? Interestingly, the late mineral water manufacturer, Robert Owen of Northgate Street, who died in 1885, had a son named William, who was also in the business. However, Owen's company seems to have closed down soon after his death as it is not listed in Porter's Directory of 1886, nor in the 1891 census. I cannot imagine that they would have held on to all the equipment for seven years before selling them off. Sadly, John Owen Jones was not to enjoy his new business venture for very long, as he died on the 10th. of July 1893 at Cefnhegwrt, Llandwrog. He had apparently been suffering from ill-health for some time as it was stated in his obituary, (Carnarvon & Denbigh Herald, Friday 14th. July 1893), that he had been staying at Llandwrog for some months for the benefit of his health. He was buried at Llanbeblig on Thursday the 13th. of July, when one of the chief mourners was his eldest son, Owen. It seems that due to his failing health, the setting up and running of the business had been handed over to Owen, who by this time was a partner in his father's Wine & Spirit business. This ties in with the name on the bottles. The Wine & Spirit Merchants was sold after John Owen Jones' death, local entrepreneur Harry Harwood taking over the reins, and he is so listed in Slater's Directory of 1895. But what became of the Carnarvon Mineral Water Company? It appears that one of the main reasons behind the scarcity of the firm's bottles and advertising was its extremely short lifespan. It is not listed in Slaters in 1895, and Owen Jones himself cannot be found on the 1901 Census. This leads me to conclude that the business was active for little more than two years, from after October 1892 to late 1894. So a long-standing puzzle has been solved, and a little more added to our knowledge of the business history of Carnarvon. Now, can anybody help with another puzzle: just who were "D. Roberts & Co. Mineral Water Manufacturers", of Bank Quay, who only appear in Bennett's Directory of 1936? I would be pleased to hear from anybody with bottles, advertisements, photographs, etc. from this company or any of the other Carnarvon Mineral Water Manufacturers. My email address appears on the Contact Page.